Palmetto Acres Lucinda is the daughter of two lambs I sold in 2007. I really liked the look of her and was pleased to be able to buy her as a lamb in 2009. 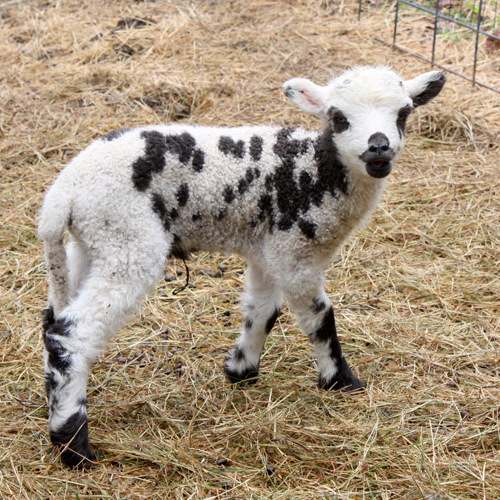 I was less certain about the fact that her mother, Shelby, had rejected her first lamb in 2008 and had rejected Lucinda’s twin brother in 2009. 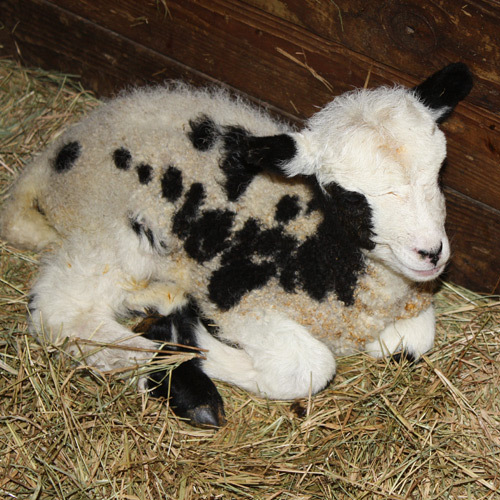 The owner said that Shelby was tossing her lambs and she felt she needed to intervene. The background of Shelby shows a strong line of good mothers and a line of ewes that have managed quite well without interference. Lucinda lambed out in the paddock. She started to clean her handsome son and continued to clean and clean and clean. When her lamb wanted to nurse, she would toss him (semi-gently) about three feet away and go over to begin cleaning him again. This went on for about an hour. She finally decided he was clean enough and let him nurse. If I had not been watching this, I would have just found them happily bonded and a lamb with a full tummy when I did a lamb check a few hours later. Watching this behavior did give me a few anxious moments, but there was no need for my help – even though I admit to thinking about it often during that hour! Sometimes (often times), the shepherd best serves her flock by watchful waiting. 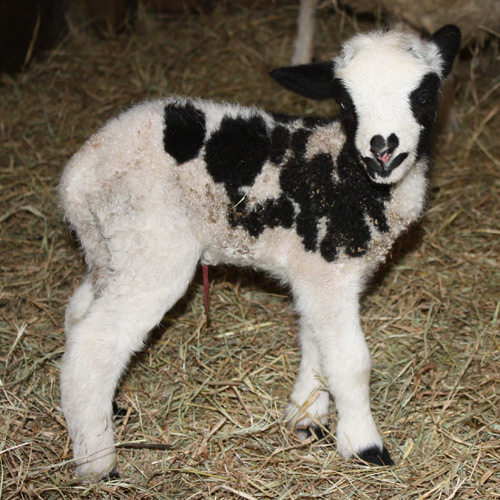 Lucinda’s lamb is named Kato, after Sawao Kato, considered one of the greatest gymnasts in history. The boy can sure roll and bounce. Not long after Kato’s birth, Lacey, another first time mother, went into labor, delivered a striking lilac ram, cleaned him, nursed him and settled down to enjoy her own personal molasses tub. Nothing remarkable about the delivery except the fleece on this boy. His name keeps changing and probably will for awhile until I hit on something that just seems to suit. He’s Dillinger for today. As always, I love the beginning of lambing and the end of lambing. The anticipation and excitement as lambs are born is the culmination of months of planning even before the months of gestating. 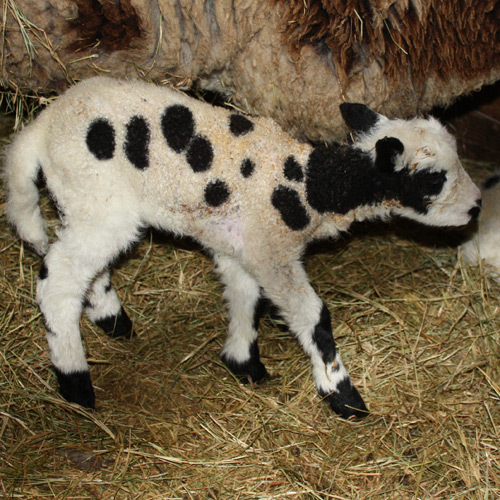 I am thankful for the 28 healthy lambs that were born here in 2011. Our final stats are 12 ewes delivered twins, 4 delivered singles. We had 12 ram and 16 ewes born. Now comes another period of watchful waiting (and tightly crossed fingers) as we watch these lambs, especially their horns, develop. And to watch them grow from cute, healthy lambs to quality (or not) adult Jacob Sheep. Congrats on the successful lambing season! Congrats on your successful lambing season linda.You did not loose one? Lucky! They all look great.